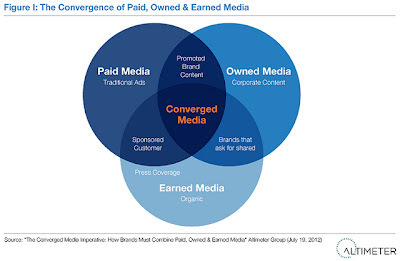 I had the opportunity to review Altimeter's new report, "The Converged Media Imperative: How Brands Must Combine Paid, Owned and Earned Media." The report by Rebecca Lieb and Jeremiah Owyang is smart and right, but if you work in social media it probably contains little you do not already know. That's not a criticism of the report, but the state of converged media is so nascent that there isn't much to say except "break down silos." Let's face it--most marketers and agencies only "got" the need to truly converge digital and traditional media about five years ago. It took almost a decade after the mass adoption of the public Web before agencies stopped being distinctly "above the line" versus "digital." For most of that period, the web was an afterthought--marketers and their agencies dreamed up big ideas to be executed in traditional media, and then added on a brochureware site and a small banner ad buy almost as an afterthought. Given this recent history, it probably comes as no surprise to anyone that agencies and marketers are struggling to integrate paid, owned and earned (POE). My personal experience is that agencies are better equipped to deal with POE convergence today than they were digital/traditional convergence a decade ago. The generation of agency execs who grew up with digital media were quick to adjust to the importance of social media and the need for marketing strategies that converge media. Despite this, the Altimeter report observes too many agencies are stuck in the campaign mindset and fall back on single-channel expertise. It is ironic to read that "Digital agencies claim social agencies lack larger brand perspective," since that was exactly the criticism aimed at digital agencies by their traditional counterparts not so long ago. While agencies continue to struggle with the rapid changes in media habits and toolsets, they seem better prepared for the demands of convergence than many on the client side. For marketers, the challenges of converging media seem greater. As noted in the report, "Internally, brands are organized in marketing sub-groups that are territorial, competitive, and political." It's not merely that different people are responsible for paid media, PR and brand (not to mention hiring, training, customer care and product management); it's that they speak different languages, measure success with different metrics and fight for the same limited budget. As the corporate budget for social goes from six figures to seven and eventually to eight, the reaction will look less like a collaboration in media convergence and more like a cage match for the heart and soul of corporate social media. Both agencies and marketers have a common gripe when it comes to media convergence: The state of existing tools. The report notes that "Agencies struggle... with ever-changing tool sets" and that marketers are "kneecapped" by "disparate tools." The Altimeter report notes that vendors recognize media is converging but still tend to rely on their traditional strengths. Even the recent spate of acquisitions hasn't helped matters, since integrating disparate systems takes time. Bridge internal teams: There is perhaps nothing more important for today's social media leader than being an educator, networker and collaborator. In an organization of even modest scale, the success of a social media leader won't be measured based on what his or her own team produces but by what is enabled across the enterprise. Give agency leaders who can bridge the functions a seat at the decision-making table: Don't merely work with the social teams within your agency partners. Even worse, don't hire your own social agencies, separate from the agencies used by others in the organization. It may be tempting to hire and control your own agency relationship, but your enterprise cannot converge if the agencies are intentionally distinct and incompatible. Work closely with agency partners that have deep expertise in tools and data: Your organization needs an agency that gets the way social media data is used and the tools necessary to make social work at scale. It doesn't take a high level of interdepartmental collaboration to understand the importance of this in today's world. Make sure agency selection processes include considerations for deep social execution capabilities and not merely high-level Facebook strategies or paid media tactics. The Altimeter report ends with a statement that many seem to understand but few live by in today's fractured landscape of corporate departments, vendors and agencies: "Preparing for Paid, Owned and Earned integration is not just a demand of present reality, but an inevitable necessity of the future of marketing, advertising, and communications." Amen!